Changes in the concentration of greenhouse gases affect both the temperature and the hydrology of the continents, which in turn affect the rate of uptake of CO2 via silicate mineral weathering. The principal greenhouse gases of interest are CO2 and CH4. (Although H2O is the strongest greenhouse gas, it is buffered by evaporation and condensation that is driven by external factors such as solar radiation and the CO2 greenhouse effect.) The buildup of CO2 in the atmosphere can lead to higher temperatures, more rain on the continents, more runoff, and thus faster weathering. It is well established that minerals dissolve faster at higher temperatures and with greater rainfall (e.g., Jenny, 1941). Thus, changes in weathering rate induced by variations in CO2 can serve as a negative feedback for stabilizing global temperature (Walker et al., 1981; Berner et al., 1983). This is illustrated in figure 2.4 in terms of a simple systems analysis feedback diagram. The effect of changes in concentrations of methane can be important to weathering only when it becomes the dominant greenhouse gas. This was probably the case for the Archean (Pavlov et al., 2000) and possibly much of the Proterozoic (Schrag et al., 2002; Pavlov et al., 2003). However, for the Phanerozoic this was unlikely because of the presence of relatively high levels of O2 (compared to the Precambrian). Because CH4 is rapidly oxidized to CO2 in the atmosphere (residence time of atmospheric CH4 is only about 10 years), Phanerozoic levels of CH4 probably never were high enough over sufficiently long periods to act as the dominant greenhouse gas. Figure 2.4. 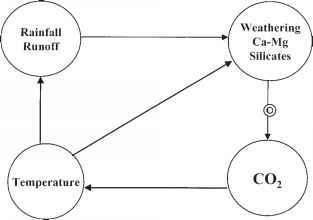 Systems analysis diagram for the greenhouse-silicate weathering feedback. In such diagrams arrows with bullseyes represent negative response; without arrows positive response. A complete cycle with an odd numbers of bullseyes means negative feedback and stabilization; a complete cycle with an even number of bullseyes, or no bullseyes, means positive feedback and (normally) destabilization. T (t) = global mean surface temperature at some past time T(0) = global mean surface temperature for the present RCO 2 = ratio of mass of CO2 in the atmosphere at time t to that at present r = coefficient derived from GCM modeling. For the purpose of studying the carbon cycle on a Phanerozoic time scale, the "present" can be assumed to be preindustrial with a CO2 concentration of 280 ppm and a global mean temperature of 15°C. J = dissolution rate in terms of an equivalent weathering uptake of CO2 to form dissolved HCO3-. Units are mass per unit volume of soil (regolith) water per unit time Jo = dissolution rate for the standard state. Table 2.2. Activation energies for silicate rock and mineral dissolution. aBased on silica dissolution. bBased on Na dissolution. cMediated by lichens. where Z is equal to AE/RTTo (symbolized as ACT in Berner and Kothavala, 2001). Equation (2.11) is a form that is especially useful in carbon cycle modeling. C = global average concentration of dissolved HCO3- from silicate weathering, in mass per unit volume, in the regolith pore solution and eventually in river water r = global mean runoff (volume per unit time per unit area) A = surface area of that portion of the continents undergoing silicate weathering V = volume of water contained in the global regolith. where k' is a parameter expressing the relation between the mean thickness of the global regolith and runoff. Equation (2.16) is used to convert J to C to determine the global flux of HCO3- from silicate weathering. In doing carbon cycle modeling, it is important to remember that it is the temperature of the land actually undergoing weathering that is relevant. Thus, the use of global mean temperature (which includes the oceans) as it relates to CO2 level (equation 2.8) is an oversimplification. However, in the absence of available paleo-land temperature versus CO2 data, modeling to date has been forced to use this simplification (e.g., Walker et al., 1981; Berner, 1994; Wallmann, 2001). Furthermore, the mean temperature of the land is inappropriate because it includes areas of glaciers or deserts where there is virtually no chemical weathering. 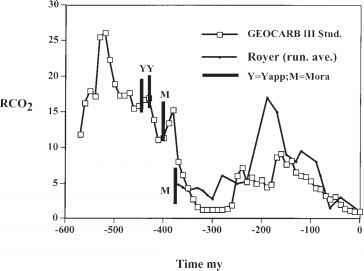 An attempt to apply a more rigorous approach, by looking at the relation between CO2 and the temperature of land with precipitation >25 cm/year (no deserts) and a mean yearly temperature >-5°C (no glaciers), has been applied to a GCM study of weathering during the Cretaceous (80 Ma) by Kothavala, Grocke, and Berner (unpublished ms). where r represents runoff, T is global mean temperature at some past time, and To is that for the preindustrial present. Y is an empirical parameter fit to the GCM results (symbolized as RUN in Berner and Kothavala, 2001). A plot of equation (2.23), which represents the greenhouse-caused negative feedback response to changes in atmospheric CO2, is shown in figure 2.5. How does silica weathering effect co2 levels? How greenhouse effect affects weathering? How can weathering help greenhouse gases in atmosphere?